Class Tours from 9:30-3:30 p.m.
Special Guest – MadScience with hands on experiments for everyone during the evening program! No need to have a project to enjoy the hands-on experiments! Fun for the whole family! If you are planning on participating in the 2018-19 Science Fair, please fill out the entry form/proposal form and return to school between January 28th to Friday, February 1st. Entries are due no later then February 1st. While parent involvement is welcomed, we strongly encourage students to do as much as possible on their own. You can think up your own project or get ideas from science books at home or at school library, your teacher , or the resource links at the side. 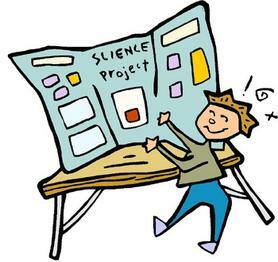 Science Fair Projects must be in the form of a tri-fold poster board. EXAMPLE: Please include your name, grade and teacher on the back of the board. Students that turn in their projects on time – Feb 8th between 8:45-9:00 am - will receive a special, small prize. Ribbons will be given out to all experiments during the evening program. Forms and instructions can be found by clicking the buttons on the right. Interested in volunteering: click HERE. 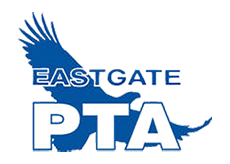 This program is sponsored by Eastgate PTA and run by PTA volunteers.